The world already has no shortage time management books, but 18 Minutes from HBR columnist Peter Bregman offers a concise and personalized account of becoming more productive. The book makes a strong connection between being productive and achieving the things that you want to achieve. Sometimes, time management books don’t make that important connection and you end up learning how to rifle through email efficiently, but not ending up achieving what you want to get done for the day, the month or the year. The personalized examples that the author works in also lend the book a credible human angle. The book is also pretty quick read (4-6 hours or so), so you’ll likely find some useful tips without it taking to much of your time. 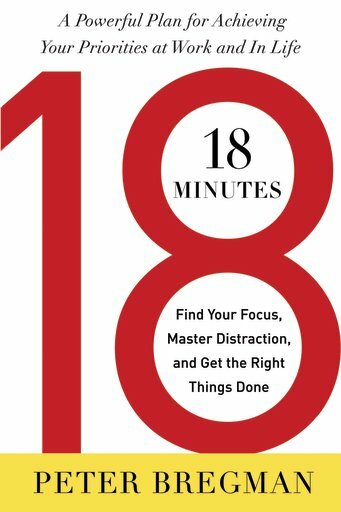 For me, the key insights were the reminder on how inefficient multitasking is, and how it’s equivalent to being drunk or on drugs so if you devote yourself to a single task at a time, you may feel slower but do a lot better at whatever you’re trying to accomplish and get it done faster with higher quality. Secondly, the importance of not being reactive to just what’s in your inbox but making sure you get out of email and think about what’s important for the day or for the year. It can be hard to make time for this, but it’s critically important to make that connection. The title comes from the amount of time Peter’s process will take each day if you follow it, though to me, the book worked better as a list of interesting ideas, than a single plan to adhere to, and I think that’s ultimately the author’s thinking too.